Many of us have problems like battery drains out completely very sooner than expected, sometimes it happens due to excessive use of applications which run in background without our consent or also sometimes your battery might be a faulty one. So, if your battery is alright and still if you feel that the battery is emptied up pretty quickly then all you will be requiring is some tips to keep your battery running for quite a long period of time. We will be discussing about some simple tips which generally are common but are left out by us manier times. First and the foremost tip is never ever expose your iPhone or your iPod in a hot car or in a sunlight as heat kills the batteries faster than any other factor. Always try and store your iPhone or i Pod in a cool or in a mild environment. Second most important thing is always keep the screen brightness in the automatic mode and never set your screen for maximum brightness as it will eat up more than 80% of the battery just for displaying things which in turn reduces the battery charge very quickly, even sooner than expected. If you are not sure about how to set the device’s brightness to automatic, then all you need to do is to first go to Settings, then select Brightness & Wallpaper to adjust the default brightness manually to as low as 30% or even you can leave it as Automatic, by checking the option of Auto Brightness. Third most important and basic tip for optimizing or increasing your battery charge is always set auto lock duration to a minimum available time like in case of Apple products is 2 minutes. If you want to set the lock duration automatically then first head to Settings and then to Auto Lock and select the minimum duration like say 2 minutes. This sometimes makes a big difference as if the auto lock duration is huge like say 5 minutes or 10 minutes, the battery drains out at a very faster rate. If you are traveling or interested in playing games for some time and if network is weak then prefer to select Airplane mode where at least it will keep on searching for Network in the background which indeed eats up most of the battery. Most of the times this tip is not followed or sometimes ignored but trust me when you are traveling its recommended to turn your phone either completely off till you reach your destination or at least turn Airplane mode ON if you plan to listen to music or read some e books on your device. If we go by the words of Apple, the battery charge in i Pad will last for 10 hours under regular use with Wi Fi but will only last for 9 hours if we use 3G network whereas iPhone will last for 6 hours if used on 3G network and 10 hours if used on Wi Fi. So you can save a 10% battery in your i Pad and a whopping 40% battery charge on your i Phone if Wi Fi is preferred than 3G. To enable Wi Fi, go to Settings and tap on Wi Fi to select your Wi Fi network. If you’ve got a bunch of emails and if you are the person who checks more frequently then its recommended to set the fetching of mails manually rather than automatically as this too saves a battery by a very fair amount. Head to Settings and then tap on Mail, Contacts, Calendars and select Fetch New Data and change the setting to the least frequent check possible that is nothing but manually. 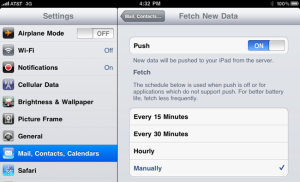 If you don’t use it often, you can just turn Push off entirely and then manually check when you need to. It is always recommended that the notifications from twitter and other IMs should be turned off when you are busy in some work or when not needed. All you need to do is to just head to Settings, select Notifications and save a bit of extra battery life since your device won’t be extracting the data continuously from the internet regularly. It may sound bit of a silly but its better to remove the system sounds as almost every time you use your device this eats up your batter regularly whenever you tap on your screen. For this Head into Settings and then select General and then tap on Sounds to change the options. If you don’t use bluetooth more often then don’t use Blue tooth head set or even blue tooth keyboard as communication between both eats up battery by a fair amount. For setting this up, go to Settings then to General and then tap on Blue tooth and flip it to Off. Make sure that at least once in a month your i device discharges completely so that your battery efficiency is increased and never keep your phone for overnight charge as this may ware out your batter by nearly 5 times than regular use and also never charge repeatedly even if it is more than 85 – 90 % as your battery tends to die down quickly than expected. Always remember to disable the vibrate feature while playing games as whenever your phone vibrates internally the motor runs and for that motor to run it requires battery so it is better to turn off vibrate feature while playing games which will further save your battery. So above mentioned are the twelve tips which are small and simple but many times we ignore. But if all the above steps are followed then you can make the most of your battery with a single full charge.